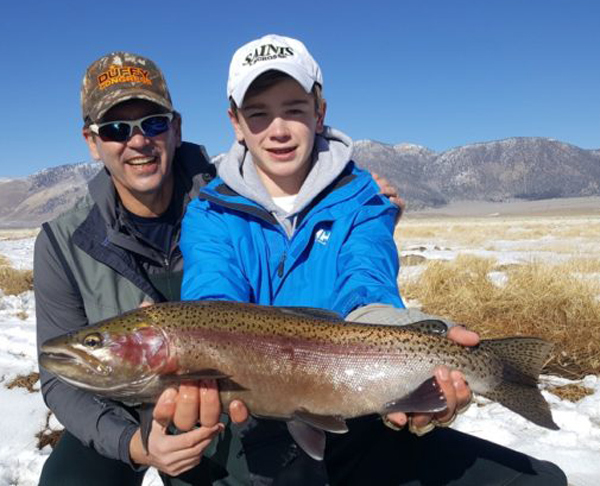 15 year old Bjorn Davidson is all smiles and probably a little shocked at what he pulled out of here on a cold morning with Two Bug Doug as his guide. That’s what it’s all about Bjorn! Careful driving in here, and especially going out after the snow has melted in the ruts. Morning temps have been below zero earlier in the week, and are just starting to come up to single digits. Ice in the rod guides is the norm here until the air temps warm up enough. Check your reels for freeze-lock after a few casts. 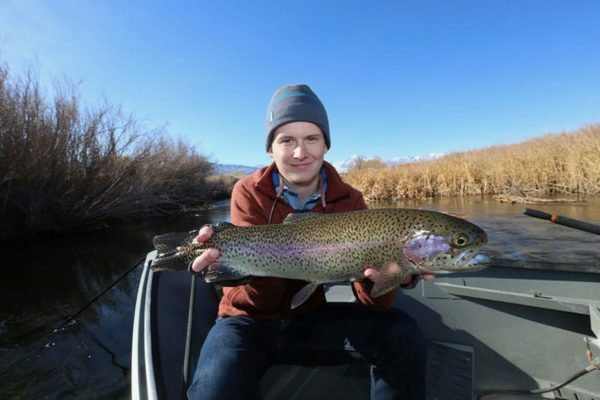 You don’t want that trophy rainbow to break off your fly after putting in all the effort to get him/her to bite. Submerging your rod and reel in the river for a good 15-20 seconds should do the trick. Flows are holding at 57 cfs. Egg patterns are our go-to rigs in the cold mornings. Combine these with leeches, assassins, SJ worms, and PT’s. Switch to midges, emergers, and small “strymph” (streamer/nymph) patterns as the daytime temps warm. The fish will move every few days or so at this low flow rate, so covering water is still the way to go. Locating fish now means covering water.